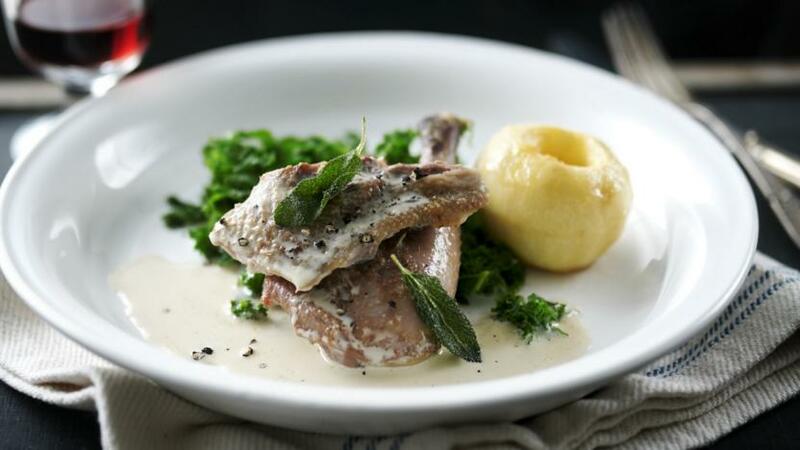 Pot-roasting pheasant makes it deliciously moist and the creamy cider sauce is the perfect accompaniment. Melt the butter in a large non-stick casserole pot. Season the pheasants with salt and ground black pepper. Place the pheasants into the casserole pot and brown until pale golden on all sides. Remove from the pot and set aside. 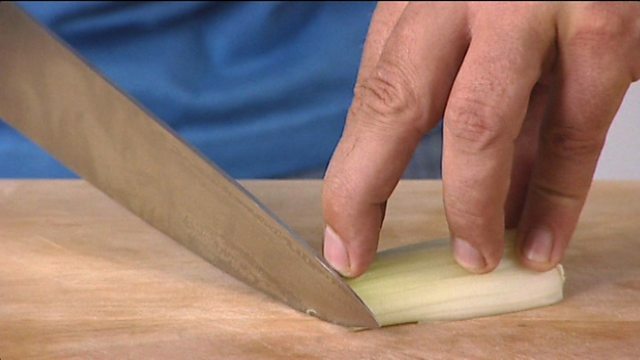 Add the onions, bacon, celery, carrot and sage sprigs to the pot and cook over a medium heat until the onion is soft and translucent and the bacon is crispy. Carefully pour off any excess fat that has emerged from the lardons. Return the pheasants to the pot and sprinkle over the apples. Pour over the calvados and set alight. Once the flames have died down add 290ml/½ pint of the cider and the chicken stock. Bring to a gentle simmer, cover and place in the oven for about 20 minutes. Place the apples onto a baking tray that has been brushed with a little butter and sprinkle with the sugar. Place in the oven and bake for about ½ hour, basting the apples a few times during cooking. Remove the pheasants from the pot and place on a chopping board. Remove the thighs and breasts and set aside to keep warm. Chop the carcass into four pieces and place back into the pot with the vegetables with the remaining cider. Bring to a boil and simmer gently for 5 minutes. Strain the sauce into a bowl through a fine meshed sieve. Pour the strained sauce back into the pot and add a splash of calvados. Reduce by half. Add the cream and simmer for a further 5 minutes or until the sauce is creamy and slightly thickened. Return the pheasant pieces to the pot to warm through and become coated in the sauce. Remove the baked apples from the oven. Serve on a bed of kale with a baked apple. Garnish with deep-fried sage leaves and crispy pancetta.